"Methanal" redirects here. It is not to be confused with Methanol or Menthol. For other uses, see Formaldehyde (disambiguation). Formaldehyde (systematic name methanal) is a naturally occurring organic compound with the formula CH2O (H-CHO). It is the simplest of the aldehydes (R-CHO). The common name of this substance comes from its similarity and relation to formic acid. Formaldehyde is an important precursor to many other materials and chemical compounds. In 1996, the installed capacity for the production of formaldehyde was estimated at 8.7 million tons per year. It is mainly used in the production of industrial resins, e.g., for particle board and coatings. In view of its widespread use, toxicity, and volatility, formaldehyde poses a significant danger to human health. In 2011, the US National Toxicology Program described formaldehyde as "known to be a human carcinogen". Formaldehyde is more complicated than many simple carbon compounds in that it adopts several different forms. As a gas, formaldehyde is colorless and has a characteristic pungent, irritating odor. Upon condensation, the gas converts to various other forms of formaldehyde (with different chemical formulas) that are of more practical value. One important derivative is the cyclic trimer metaformaldehyde (1,3,5-trioxane) with the formula (CH2O)3. There is also a linear polymer called paraformaldehyde. These compounds have similar chemical properties and are often used interchangeably. Paraformaldehyde is a common form of formaldehyde for industrial applications. When dissolved in water, formaldehyde also forms a hydrate, methanediol, with the formula H2C(OH)2. This compound also exists in equilibrium with various oligomers (short polymers), depending on the concentration and temperature. A saturated water solution, of about 40% formaldehyde by volume or 37% by mass, is called "100% formalin". A small amount of stabilizer, such as methanol, is usually added to suppress oxidation and polymerization. A typical commercial grade formalin may contain 10–12% methanol in addition to various metallic impurities. The name was genericised long ago from an old trade name, "Formalin". Processes in the upper atmosphere contribute up to 90% of the total formaldehyde in the environment. Formaldehyde is an intermediate in the oxidation (or combustion) of methane, as well as of other carbon compounds, e.g. in forest fires, automobile exhaust, and tobacco smoke. When produced in the atmosphere by the action of sunlight and oxygen on atmospheric methane and other hydrocarbons, it becomes part of smog. Formaldehyde has also been detected in outer space (see below). Formaldehyde and its adducts are ubiquitous in living organisms. It is formed in the metabolism of endogenous amino acids[which?] and is found in the bloodstream of humans and other primates at concentrations of approximately 0.1 millimolar. 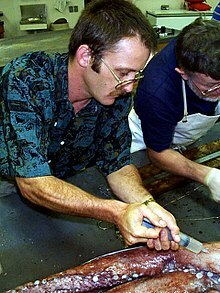 Experiments in which animals are exposed to an atmosphere containing isotopically labeled formaldehyde have demonstrated that even in deliberately exposed animals, the majority of formaldehyde-DNA adducts found in non-respiratory tissues are derived from endogenously produced formaldehyde. Formaldehyde does not accumulate in the environment, because it is broken down within a few hours by sunlight or by bacteria present in soil or water. Humans metabolize formaldehyde quickly, converting it to formic acid, so it does not accumulate in the body. Formaldehyde was the first polyatomic organic molecule detected in the interstellar medium. Since its initial detection in 1969, it has been observed in many regions of the galaxy. Because of the widespread interest in interstellar formaldehyde, it has recently been extensively studied, yielding new extragalactic sources. A proposed mechanism for the formation is the hydrogenation of CO ice, shown below. Formaldehyde appears to be a useful probe for astrochemists, due to its low reactivity in the gas phase and to the fact that the 110←111 and 211←212 K-doublet transitions are rather clear. Formaldehyde was first reported in 1859 by the Russian chemist Aleksandr Butlerov (1828–86) and was conclusively identified in 1869 by August Wilhelm von Hofmann. In principle, formaldehyde could be generated by oxidation of methane, but this route is not industrially viable because the methanol is more easily oxidized than methane. Formaldehyde is a building block in the synthesis of many other compounds of specialised and industrial significance. It exhibits most of the chemical properties of other aldehydes but is more reactive. Formaldehyde, unlike most aldehydes, oligomerizes spontaneously. The trimer is trioxane and the polymer is called paraformaldehyde. Many cyclic oligomers have been isolated. Similarly, formaldehyde hydrates to give the geminal diol, which condenses further to form oligomers HO(CH2O)nH. Monomeric CH2O is rarely encountered. It is readily oxidized by atmospheric oxygen into formic acid. For this reason, commercial formaldehyde is typically contaminated with formic acid. Formaldehyde is a good electrophile. With good nucleophiles such as thiols, amines, and even amides, no acid catalyst is required. The resulting hydroxymethyl derivatives typically react further. Thus amines give hexahydro-1,3,5-triazines. Similarly, when combined with hydrogen sulfide, it forms trithiane. When conducted in the presence of hydrogen chloride, the product is the chloromethyl compound, as described in the Blanc chloromethylation. If the arene is electron-rich, as in phenols, elaborate condensations ensue. With 4-substituted phenols one obtains calixarenes. Phenol results in polymers. Cannizzaro reaction in the presence of basic catalysts to produce formic acid and methanol. Formaldehyde is a common precursor to more complex compounds and materials. In approximate order of decreasing consumption, products generated from formaldehyde include urea formaldehyde resin, melamine resin, phenol formaldehyde resin, polyoxymethylene plastics, 1,4-butanediol, and methylene diphenyl diisocyanate. The textile industry uses formaldehyde-based resins as finishers to make fabrics crease-resistant. Formaldehyde-based materials are key to the manufacture of automobiles, and used to make components for the transmission, electrical system, engine block, door panels, axles and brake shoes. The value of sales of formaldehyde and derivative products was over $145 billion in 2003, about 1.2% of the gross domestic product (GDP) of the United States and Canada. Including indirect employment, over 4 million people work in the formaldehyde industry across approximately 11,900 plants in the U.S. and Canada. When treated with phenol, urea, or melamine, formaldehyde produces, respectively, hard thermoset phenol formaldehyde resin, urea formaldehyde resin, and melamine resin. These polymers are common permanent adhesives used in plywood and carpeting. It is used as the wet-strength resin added to sanitary paper products such as (listed in increasing concentrations injected into the paper machine headstock chest) facial tissue, table napkins, and roll towels. They are also foamed to make insulation, or cast into moulded products. Production of formaldehyde resins accounts for more than half of formaldehyde consumption. Formaldehyde is also a precursor to polyfunctional alcohols such as pentaerythritol, which is used to make paints and explosives. Other formaldehyde derivatives include methylene diphenyl diisocyanate, an important component in polyurethane paints and foams, and hexamine, which is used in phenol-formaldehyde resins as well as the explosive RDX. Condensation with acetaldehyde affords pentaerythritol, a chemical necessary in synthesizing PETN, a high explosive. Condensation with phenols gives phenol-formaldehyde resins. An aqueous solution of formaldehyde can be useful as a disinfectant as it kills most bacteria and fungi (including their spores). It is used to produce killed vaccines. Formaldehyde releasers are used as biocides in personal care products such as cosmetics. Although present at levels not normally considered harmful, they are known to cause allergic contact dermatitis in certain sensitised individuals. Aquarists use formaldehyde as a treatment for the parasites Ichthyophthirius multifiliis and Cryptocaryon irritans. Formaldehyde is also approved for use in the manufacture of animal feeds in the US. It is an antimicrobial agent used to maintain complete animal feeds or feed ingredients Salmonella negative for up to 21 days. Formaldehyde preserves or fixes tissue or cells. The process involves cross-linking of primary amino groups. The European Union has banned the use of formaldehyde due to its carcinogenic properties as a biocide (including embalming) under the Biocidal Products Directive (98/8/EC). Countries with a strong tradition of embalming corpses, such as Ireland and other colder-weather countries, have raised concerns. Despite reports to the contrary, no decision on the inclusion of formaldehyde on Annex I of the Biocidal Products Directive for product-type 22 (embalming and taxidermist fluids) had been made as of September 2009[update]. Formaldehyde-based crosslinking is exploited in ChIP-on-chip or ChIP-sequencing genomics experiments, where DNA-binding proteins are cross-linked to their cognate binding sites on the chromosome and analyzed to determine what genes are regulated by the proteins. Formaldehyde is also used as a denaturing agent in RNA gel electrophoresis, preventing RNA from forming secondary structures. A solution of 4% formaldehyde fixes pathology tissue specimens at about one mm per hour at room temperature. Formaldehyde and an 18 M (concentrated) sulfuric acid makes Marquis reagent—which can identify alkaloids and other compounds. In photography, formaldehyde is used in low concentrations for process C-41 (color negative film) stabilizer in the final wash step, as well as in the process E-6 pre-bleach step, to make it unnecessary in the final wash.
Formaldehyde topical can be used as an antiperspirant to treat hyperhydrosis. The safety of formaldehyde is very complicated. It occurs naturally and is "an essential intermediate in cellular metabolism in mammals and humans." It is not acutely toxic as ingestion of many milliliters is tolerated. The main concerns are associated with chronic (long term) exposure by inhalation. This may happen through three main sources: thermal or chemical decomposition of formaldehyde-based resins, emission from aqueous formaldehyde solutions (i.e. embalming fluids), and the production of formaldehyde resulting from the combustion of a variety of organic compounds (for example, exhaust gases). As formaldehyde resins are used in many construction materials it is one of the more common indoor air pollutants. At concentrations above 0.1 ppm in air formaldehyde can irritate the eyes and mucous membranes, resulting in watery eyes. Formaldehyde inhaled at this concentration may cause headaches, a burning sensation in the throat, and difficulty breathing, and can trigger or aggravate asthma symptoms. A 1988 Canadian study of houses with urea-formaldehyde foam insulation found that formaldehyde levels as low as 0.046 ppm were positively correlated with eye and nasal irritation. A recent review of studies has shown a strong association between exposure to formaldehyde and the development of childhood asthma. The primary exposure concern is for the workers in the industries producing or using formaldehyde. The formaldehyde theory of carcinogenesis was proposed in 1978. In 1987 the U.S. EPA classified it as a probable human carcinogen, and after more studies the WHO International Agency for Research on Cancer (IARC) in 1995 also classified it as a probable human carcinogen. Further information and evaluation of all known data led the IARC to reclassify formaldehyde as a known human carcinogen associated with nasal sinus cancer and nasopharyngeal cancer. Recent studies have also shown a positive correlation between exposure to formaldehyde and the development of leukemia, particularly myeloid leukemia. Nasopharyngeal and sinonasal cancers are relatively rare, with a combined annual incidence in the United States of < 4,000 cases. About 25,000 cases of myeloid leukemia occur in the United States each year. Workplace exposure to inhaled chemicals is among the most important risk factors for sinonasal cancers. Professionals exposed to formaldehyde in their occupation, such as funeral industry workers and embalmers, showed an increased risk of leukemia and brain cancer compared with the general population. Other factors are important in determining individual risk for the development of leukemia or nasopharyngeal cancer. In the residential environment, formaldehyde exposure comes from a number of different routes; formaldehyde can off-gas from wood products, such as plywood or particle board, but it is produced by paints, varnishes, floor finishes, and cigarette smoking as well. In July 2016, the EPA released a prepublication version of its final rule on Formaldehyde Emission Standards for Composite Wood Products. These new rules impact manufacturers, importers, distributors, and retailers of products containing composite wood, including fiberboard, particleboard, and various laminated products, who must comply with more stringent record-keeping and labeling requirements. The United States Environmental Protection Agency (EPA) allows no more than 0.016 ppm formaldehyde in the air in new buildings constructed for that agency. A U.S. Environmental Protection Agency study found a new home measured 0.076 ppm when brand new and 0.045 ppm after 30 days. The Federal Emergency Management Agency (FEMA) has also announced limits on the formaldehyde levels in trailers purchased by that agency. The EPA recommends the use of "exterior-grade" pressed-wood products with phenol instead of urea resin to limit formaldehyde exposure, since pressed-wood products containing formaldehyde resins are often a significant source of formaldehyde in homes. For most people, irritation from formaldehyde is temporary and reversible, though formaldehyde can cause allergies and is part of the standard patch test series. In 2005–06, it was the seventh-most-prevalent allergen in patch tests (9.0%). People with formaldehyde allergy are advised to avoid formaldehyde releasers as well (e.g., Quaternium-15, imidazolidinyl urea, and diazolidinyl urea). 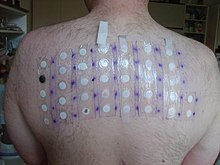 People who suffer allergic reactions to formaldehyde tend to display lesions on the skin in the areas that have had direct contact with the substance, such as the neck or thighs (often due to formaldehyde released from permanent press finished clothing) or dermatitis on the face (typically from cosmetics). Formaldehyde has been banned in cosmetics in both Sweden and Japan. The eyes are most sensitive to formaldehyde exposure: The lowest level at which many people can begin to smell formaldehyde is about 0.05 ppm and the highest level is 1 ppm. The maximum concentration value at the workplace is 0.3 ppm. In controlled chamber studies, individuals begin to sense eye irritation at about 0.5 ppm; 5 to 20 percent report eye irritation at 0.5 to 1 ppm; and greater certainty for sensory irritation occurred at 1 ppm and above. While some agencies have used a level as low as 0.1 ppm as a threshold for irritation, the expert panel found that a level of 0.3 ppm would protect against nearly all irritation. In fact, the expert panel found that a level of 1.0 ppm would avoid eye irritation—the most sensitive endpoint—in 75–95% of all people exposed. Formaldehyde levels in building environments are affected by a number of factors. These include the potency of formaldehyde-emitting products present, the ratio of the surface area of emitting materials to volume of space, environmental factors, product age, interactions with other materials, and ventilation condition. Formaldehyde emits from a variety of construction materials, furnishings, and consumer products. The three products that emit the highest concentrations are medium density fiberboard, hardwood plywood, and particle board. Environmental factors such as temperature and relative humidity can elevate levels because formaldehyde has a high vapor pressure. Formaldehyde levels from building materials are the highest when a building first opens because materials would have less time to off-gas. Formaldehyde levels decrease over time as the sources suppress. Formaldehyde levels in air can be sampled and tested in several ways, including impinger, treated sorbent, and passive monitors. The National Institute for Occupational Safety and Health (NIOSH) has measurement methods numbered 2016, 2541, 3500, and 3800. Studies on the interactions between formaldehyde and proteins at the molecular level have been reported on the effects of the body's carrier protein, serum albumin. The binding of formaldehyde loosens the skeletal structure of albumin and exposure of aromatic ring amino acids in the internal hydrophobic region. Symptoms may affect personal awareness, making one feel tired or fatigued. 3 levels in plasma. This result suggests that FA inhalation either decreased NO production or increased NO scavenging, which may be an anti-stress mechanism in the body. Formaldehyde inhalation changes the sensitivity of immune system, which influences oxidative stress. In June 2011, the twelfth edition of the National Toxicology Program (NTP) Report on Carcinogens (RoC) changed the listing status of formaldehyde from "reasonably anticipated to be a human carcinogen" to "known to be a human carcinogen." Concurrently, a National Academy of Sciences (NAS) committee was convened and issued an independent review of the draft United States Environmental Protection Agency IRIS assessment of formaldehyde, providing a comprehensive health effects assessment and quantitative estimates of human risks of adverse effects. Several web articles claim that formaldehyde has been banned from manufacture or import into the European Union (EU) under REACH (Registration, Evaluation, Authorization, and restriction of Chemical substances) legislation. This is misinformation, as official EU chemical databases[which?] contradict these claims as of February 19, 2010. This misconception has gained some ground. Formaldehyde is not listed in the Annex I of Regulation (EC) No 689/2008 (export and import of dangerous chemicals regulation), nor on a priority list for risk assessment. However, formaldehyde is banned from use in certain applications (preservatives for liquid-cooling and processing systems, slimicides, metalworking-fluid preservatives, and antifouling products) under the Biocidal Products Directive. In the EU, the maximum allowed concentration of formaldehyde in finished products is 0.2%, and any product that exceeds 0.05% has to include a warning that the product contains formaldehyde. In the United States, Congress passed a bill July 7, 2010 regarding the use of formaldehyde in hardwood plywood, particle board, and medium density fiberboard. The bill limited the allowable amount of formaldehyde emissions from these wood products to .09 ppm, and required companies to meet this standard by January 2013. Formaldehyde was declared a toxic substance by the 1999 Canadian Environmental Protection Act. In the U.S. the Federal Emergency Management Agency (FEMA) provided travel trailers, recreational park trailers and manufactured homes starting in 2006 for habitation by residents of the U.S. gulf coast displaced by Hurricane Katrina and Hurricane Rita. Some of the people who moved into the FEMA trailers complained of breathing difficulties, nosebleeds, and persistent headaches. Formaldehyde-catalyzed resins were used in the production of these homes. The United States Centers For Disease Control and Prevention (CDC) performed indoor air quality testing for formaldehyde in some of the units. On February 14, 2008, the CDC announced that potentially hazardous levels of formaldehyde were found in many of the travel trailers and manufactured homes provided by the agency. The CDC's preliminary evaluation of a scientifically established random sample of 519 travel trailers and manufactured homes tested between December 21, 2007, and January 23, 2008 (2+ years after manufacture), showed average levels of formaldehyde in all units of about 0.077 parts per million (ppm). Long-term exposure to levels in this range can be linked to an increased risk of cancer and, at levels above this range, there can also be a risk of respiratory illness. These levels are higher than expected in indoor air, where levels are commonly in the range of 0.01–0.02 ppm, and are higher than the Agency for Toxic Substance Disease Registry (ATSDR, division of the CDC) Minimal Risk Level (MRL) of 0.008 ppm. Levels measured ranged from 0.003 ppm to 0.59 ppm. FEMA, which requested the testing by the CDC, said it would work aggressively to relocate all residents of the temporary housing as soon as possible. Lawsuits were filed against FEMA trailer manufacturers as a result of the exposures. As of 2012, U.S. District Judge Kurt D. Engelhardt of New Orleans approved a $42.6 million class-action lawsuit settlement for the plaintiffs, who included roughly 55,000 residents of Louisiana, Mississippi, Alabama and Texas. The defendants included two dozen manufacturers who built mobile homes for the Federal Emergency Management Agency (FEMA), including Gulf Stream Coach Inc., Forest River Inc., Vanguard LLC and Monaco Coach Corp. A separate $5.1 million settlement dealt with claims against FEMA contractors including Shaw Environmental Inc., Bechtel Corp., Fluor Enterprises Inc. and CH2M Hill Constructors Inc., who were responsible for installing and maintaining the units. Also in the U.S., problems arose in trailers again provided by FEMA to residents displaced by the Iowa floods of 2008. Several months after moving to the trailers, occupants reported violent coughing, headaches, as well as asthma, bronchitis, and other problems. Tests showed that in some trailers, levels of formaldehyde exceeded the limits recommended by the U.S. Environmental Protection Agency and American Lung Association. The associated publicity has resulted in additional testing to begin in November. Scandals have broken in both the 2005 Indonesia food scare and 2007 Vietnam food scare regarding the addition of formaldehyde to foods to extend shelf life. In 2011, after a four-year absence, Indonesian authorities found foods with formaldehyde being sold in markets in a number of regions across the country. In August 2011, at least at two Carrefour supermarkets, the Central Jakarta Livestock and Fishery Sub-Department found a sweet glutinous rice drink (cendol) contained 10 parts per million of formaldehyde. In 2014, the owner of two noodle factories in Bogor, Indonesia; was arrested for using formaldehyde in noodles. 50 kg of formaldehyde was confiscated. Foods known to be contaminated included noodles, salted fish, and tofu. Chicken and beer were also rumored to be contaminated. In some places, such as China, manufacturers still use formaldehyde illegally as a preservative in foods, which exposes people to formaldehyde ingestion. In humans, the ingestion of formaldehyde has been shown to cause vomiting, abdominal pain, dizziness, and in extreme cases can cause death. Testing for formaldehyde is by blood and/or urine by gas chromatography-mass spectrometry. Other methods include infrared detection, gas detector tubes, etc., of which HPLC is the most sensitive. In the early 1900s, it was frequently added by US milk plants to milk bottles as a method of pasteurization due to the lack of knowledge regarding formaldehyde's toxicity. In 2011 in Nakhon Ratchasima, Thailand, truckloads of rotten chicken were exposed to formaldehyde in which "a large network," including 11 slaughterhouses run by a criminal gang, were implicated. In 2012, 1 billion rupiah (almost US$100,000) of fish imported from Pakistan to Batam, Indonesia, were found laced with formaldehyde. Formalin contamination of foods has been reported in Bangladesh, with stores and supermarkets selling fruits, fishes, and vegetables that have been treated with formalin to keep them fresh. However, in 2015, a Formalin Control Bill was passed in the Parliament of Bangladesh with a provision of life-term imprisonment as the maximum punishment and in addition 2,000,000 BDT as fine but not less than 500,000 BDT for importing, production or hoarding of formalin without license. ^ a b "Front Matter". Nomenclature of Organic Chemistry : IUPAC Recommendations and Preferred Names 2013 (Blue Book). Cambridge: The Royal Society of Chemistry. 2014. p. 908. doi:10.1039/9781849733069-FP001. ISBN 978-0-85404-182-4. ^ "PubChem Compound Database; CID=712". National Center for Biotechnology Information. Retrieved 2017-07-08. ^ Weast, Robert C., ed. (1981). CRC Handbook of Chemistry and Physics (62nd ed.). Boca Raton, FL: CRC Press. pp. C–301, E–61. ISBN 0-8493-0462-8. ^ a b c NIOSH Pocket Guide to Chemical Hazards. "#0293". National Institute for Occupational Safety and Health (NIOSH). ^ NIOSH Pocket Guide to Chemical Hazards. "#0294". National Institute for Occupational Safety and Health (NIOSH). ^ a b "Formaldehyde". Immediately Dangerous to Life and Health Concentrations (IDLH). National Institute for Occupational Safety and Health (NIOSH). ^ a b Harris, Gardiner (10 June 2011). "Government Says 2 Common Materials Pose Risk of Cancer". New York Times. Retrieved 2011-06-11. ^ a b National Toxicology Program (10 June 2011). "12th Report on Carcinogens". National Toxicology Program. Archived from the original on 2011-06-08. Retrieved 2011-06-11. ^ a b National Toxicology Program (10 June 2011). "Report On Carcinogens – Twelfth Edition – 2011" (PDF). National Toxicology Program. Retrieved 2011-06-11. ^ "Review of the Formaldehyde Assessment in the National Toxicology Program 12th Report on Carcinogens". p. 91. ^ "Review of the Formaldehyde Assessment in the National Toxicology Program 12th Report on Carcinogens". p. 95. ^ "Formaldehyde Is Biodegradable, Quickly Broken Down in the Air By Sunlight or By Bacteria in Soil or Water". Formaldehyde Panel of the American Chemistry Council. Retrieved 22 April 2017. ^ Zuckerman, B.; Buhl, D.; Palmer, P.; Snyder, L. E. (1970). "Observation of interstellar formaldehyde". Astrophys. J. 160: 485–506. Bibcode:1970ApJ...160..485Z. doi:10.1086/150449. ^ Mangum, Jeffrey G.; Darling, Jeremy; Menten, Karl M.; Henkel, Christian (2008). "Formaldehyde Densitometry of Starburst Galaxies". Astrophys. J. 673 (2): 832–46. arXiv:0710.2115. Bibcode:2008ApJ...673..832M. doi:10.1086/524354. ^ Woon, David E. (2002). "Modeling Gas-Grain Chemistry with Quantum Chemical Cluster Calculations. I. Heterogeneous Hydrogenation of CO and H2CO on Icy Grain Mantles". Astrophys. J. 569 (1): 541–48. Bibcode:2002ApJ...569..541W. doi:10.1086/339279. ^ A. Butlerow (1859) "Ueber einige Derivate des Jodmethylens" (On some derivatives of methylene iodide), Annalen der Chemie und Pharmacie, vol . 111, pages 242–252. In this paper, Butlerov discovered formaldehyde, which he called "Dioxymethylen" (methylene dioxide) [page 247] because his empirical formula for it was incorrect (C4H4O4). Hofmann, A.W. (1869). "Beiträge zur Kenntnis des Methylaldehyds". Journal für Praktische Chemie. 107 (1): 414–424. doi:10.1002/prac.18691070161. ^ Read, J. (1935). Text-Book of Organic Chemistry. London: G Bell & Sons. ^ "Formaldehyde in Clothing and Textiles FactSheet". NICNAS. Australian National Industrial Chemicals Notification and Assessment Scheme. May 2013. Retrieved 12 November 2014. ^ Economic Importance, Formaldehyde Council. 2009. Accessed on April 14, 2010. ^ "Ingredients of Vaccines - Fact Sheet". Center for Disease Control. Retrieved 2018-08-04. Formaldehyde is used to inactivate bacterial products for toxoid vaccines, (these are vaccines that use an inactive bacterial toxin to produce immunity.) It is also used to kill unwanted viruses and bacteria that might contaminate the vaccine during production. Most formaldehyde is removed from the vaccine before it is packaged. ^ de Groot, Anton C; Flyvholm, Mari-Ann; Lensen, Gerda; Menné, Torkil; Coenraads, Pieter-Jan (August 2009). "Formaldehyde-releasers: relationship to formaldehyde contact allergy. Contact allergy to formaldehyde and inventory of formaldehyde-releasers". Contact Dermatitis. 61 (2): 63–85. doi:10.1111/j.1600-0536.2009.01582.x. PMID 19706047. ^ Francis-Floyd, Ruth (April 1996). "Use of Formalin to Control Fish Parasites". Institute of Food and Agricultural Sciences, University of Florida. Archived from the original on May 27, 2012. ^ Patel, Alkesh (2007-07-04). "Formaldehyde Ban set for 22 September 2007". WebWire. Retrieved 19 May 2012. ^ "European chemical Substances Information System (ESIS) entry for formaldehyde". Archived from the original on 2014-01-01. Retrieved 2009-09-01. ^ "Process C-41 Using Kodak Flexicolor Chemicals – Publication Z-131". Kodak. Retrieved 2009-09-01. ^ "Medical Management Guidelines for Formaldehyde". ^ "Indoor Air Pollution in California" (PDF). Air Resources Board, California Environmental Protection Agency. July 2005. pp. 65–70. Retrieved 19 May 2012. ^ "Formaldehyde". Occupational Safety and Health Administration. August 2008. Retrieved 2009-09-01. ^ "Formaldehyde Reference Exposure Levels" (PDF). California Office Of Health Hazard Assessment. December 2008. Retrieved 19 May 2012. ^ Formaldehyde and Indoor Air. Health Canada. August 2005. ISBN 978-0-8155-1129-8. Retrieved 2009-09-01. ^ Broder, I; Corey, P; Brasher, P; Lipa, M; Cole, P (1991). "Formaldehyde exposure and health status in households". Environmental Health Perspectives. 95: 101–4. doi:10.1289/ehp.9195101. PMC 1568408. PMID 1821362. ^ McGwin, G; Lienert, J; Kennedy, JI (November 2009). "Formaldehyde Exposure and Asthma in Children: A Systematic Review". Environmental Health Perspectives. 118 (3): 313–7. doi:10.1289/ehp.0901143. PMC 2854756. PMID 20064771. ^ a b "Formaldehyde and Cancer Risk". ^ Zhang, Luoping; Steinmaus, Craig; Eastmond, Eastmond; Xin, Xin; Smith, Smith (March–June 2009). "Formaldehyde exposure and leukemia: A new meta-analysis and potential mechanisms" (PDF). Mutation Research/Reviews in Mutation Research. 681 (2–3): 150–168. doi:10.1016/j.mrrev.2008.07.002. PMID 18674636. Retrieved 2013-05-22. ^ Zhang, Luoping; Freeman, Laura E. Beane; Nakamura, Jun; Hecht, Stephen S.; Vandenberg, John J.; Smith, Martyn T.; Sonawane, Babasaheb R. (2010). "Formaldehyde and Leukemia: Epidemiology, Potential Mechanisms, and Implications for Risk Assessment". Environmental and Molecular Mutagenesis. 51 (3): 181–191. doi:10.1002/em.20534. PMC 2839060. PMID 19790261. ^ "What are the key statistics about nasopharyngeal cancer?". ^ Turner JH, Reh DD (June 2012). "Incidence and survival in patients with sinonasal cancer: a historical analysis of population-based data". Head Neck. 34 (6): 877–85. doi:10.1002/hed.21830. PMID 22127982. ^ "What are the key statistics about chronic myeloid leukemia?". ^ "What are the key statistics about acute myeloid leukemia?". ^ a b "What are the risk factors for nasopharyngeal cancer?". ^ Butticè, Claudio (2015). "Solvents". In Colditz, Graham A. The SAGE Encyclopedia of Cancer and Society (Second ed.). Thousand Oaks: SAGE Publications, Inc. pp. 1089–1091. doi:10.4135/9781483345758.n530. ISBN 9781483345734. ^ "What are the risk factors for acute myeloid leukemia?". ^ "What are the risk factors for chronic myeloid leukemia?". ^ Dales, R; Liu, L; Wheeler, AJ; Gilbert, NL (July 2008). "Quality of indoor residential air and health". Canadian Medical Association Journal. 179 (2): 147–52. doi:10.1503/cmaj.070359. PMC 2443227. PMID 18625986. ^ Passmore, Whitney; Sullivan, Michael J. (August 4, 2016). "EPA Issues Final Rule on Formaldehyde Emission Standards for Composite Wood Products". The National Law Review. Womble Carlyle Sandridge & Rice, PLLC. Retrieved August 24, 2016 – via Google News. ^ "Testing for Indoor Air Quality, Baseline IAQ, and Materials". Environmental Protection Agency. Archived from the original on October 15, 2006. ^ Evans, Ben (2008-04-11). "FEMA limits formaldehyde in trailers". Boston.com. Archived from the original on June 15, 2010. Retrieved 2008-09-04. ^ "Formaldehyde allergy". DermNet NZ. New Zealand Dermatological Society. June 2009. Retrieved 2009-09-01. ^ a b De Groot, Anton C; Flyvholm, Mari-Ann; Lensen, Gerda; Menné, Torkil; Coenraads, Pieter-Jan (2009). "Formaldehyde-releasers: relationship to formaldehyde contact allergy. Contact allergy to formaldehyde and inventory of formaldehyde-releasers". Contact Dermatitis. 61 (2): 63–85. doi:10.1111/j.1600-0536.2009.01582.x. PMID 19706047. ^ Formaldehyde and Facts About Health Effects (PDF). Formaldehyde Epidemiology, Toxicology and Environmental Group. August 2002. Accessed on April 25, 2010. ^ "European Union Bans formaldehyde/formalin within Europe" (PDF). European Commission's Environment Directorate-General. September 2007. pp. 1–3. Retrieved 19 May 2012. ^ "ESIS (European Chemical Substances Information System)". European Commission Joint Research Centre Institute for Health and Consumer Protection. February 2009. Archived from the original on 1 January 2014. Retrieved 19 May 2012. ^ "S.1660 – Formaldehyde Standards for Composite Wood Products Act". OpenCongress. July 2010. Retrieved 19 May 2012. ^ "Health Canada – Proposed residential indoor air quality guidelines for formaldehyde". Health Canada. April 2007. ^ Mike Brunker (2006-07-25). "Are FEMA trailers 'toxic tin cans'?". MSNBC. Retrieved 19 May 2012. ^ Kunzelman, Michael (2007-08-08). "Suit Filed Over FEMA Trailer Toxins". The Washington Post. Retrieved 2010-05-02. ^ Brunker, Mike (September 28, 2012). "Class-action suit against FEMA trailer manufacturers settled for $42.6 million". NBC News. Retrieved 11 September 2015. ^ Megan Terlecky (2008-10-24). "How We Tested for Formaldehyde". KGAN-TV. Archived from the original on June 15, 2011. ^ "FEMA Trailers in Iowa Exceed Formaldehyde Levels Considered Safe". Insurance Journal. October 23, 2008. Retrieved 16 September 2015. ^ Nigel Duara (2008-10-21). "FEMA disputes formaldehyde study of Iowa trailers". Associated Press. Archived from the original on October 31, 2008. ^ Cindy Hadish (2008-10-24). "FEMA meets with mobile home residents over health concerns". Cedar Rapids Gazette. Archived from the original on February 22, 2009. ^ "Formaldehyde-laced foods reemerge in Indonesian markets". August 10, 2011. ^ "Formaldehyde-Tainted Rice Drinks Found at Carrefour Markets". August 22, 2011. ^ "BPOM Uncovers Two Formaldehyde-Tainted Noodle Factories in Bogor". October 12, 2014. ^ Xiaojiang Tang et al., "Formaldehyde in China: Production, consumption, exposure levels, and health effects (PDF)", Environment International 35 (2009): 1215–16, and other references cited on p. 1216; see also "Municipality sees red over bad blood processing" (2011-03-18, China Daily, online English edition; retrieved on May 17, 2011). ^ Moise Ngwa (2010-10-25). "formaldehyde testing" (PDF). Cedar Rapids Gazette. Retrieved 19 May 2012. ^ "Was Death in the Milk?". The Indianapolis News. July 31, 1900. p. 5. Retrieved August 20, 2014 – via Newspapers.com. ^ "Wants New Law Enacted. Food Inspector Farnsworth Would Have Use of Formaldehyde in Milk Stopped". The Topeka Daily Capital. August 30, 1903. p. 8. Retrieved August 20, 2014 – via Newspapers.com. Wikisource has the text of the 1911 Encyclopædia Britannica article Formalin. NIOSH Pocket Guide to Chemical Hazards. "#0293". National Institute for Occupational Safety and Health (NIOSH). Formaldehyde Added to "Known Carcinogens" List Despite Lobbying by Chemical Industry — video report by Democracy Now! So you’re living in one of FEMA’s Katrina trailers... What can you do?